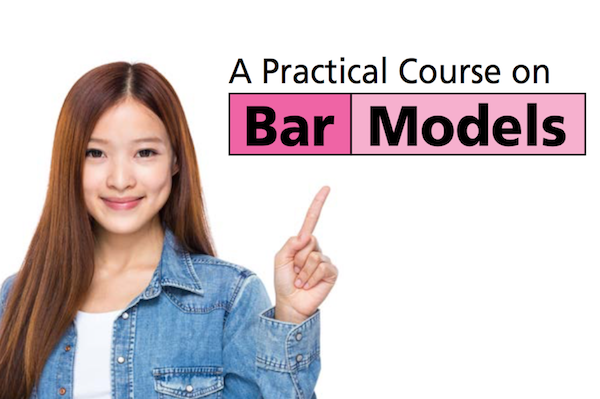 The bar model method is one of the key problem solving heuristics that students use to solve word problems in Singapore maths. It falls under the heuristic "draw a picture". By drawing a pictorial model of a word problem, students are able to visualise, represent and relate the known and unknown quantities in the word problem. This allows students to understand the word problem and find the solution to it. Bar models help students develop their mathematical thinking, communication, reasoning and problem-solving skills. 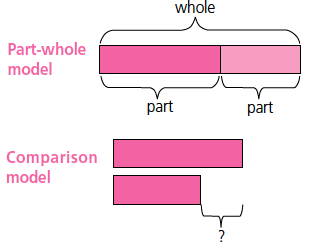 There are two main types of bar models, the part-whole model and the comparison model. 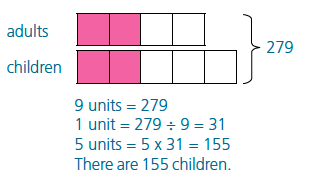 Word problems can be solved using variations or a combination of the two main types of bar models. 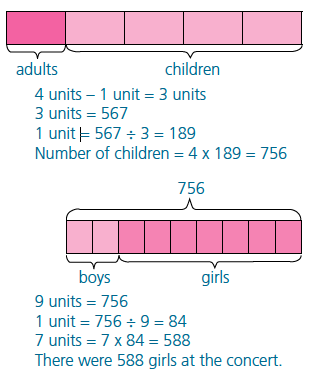 Here is an overview of how bar models are used to solve word problems on different math topics. Jimmy has 364 more cards than Tim. 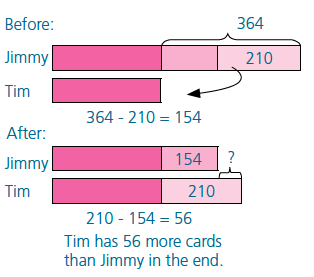 If Jimmy gives 210 cards to Tim, how many more cards does Tim have than Jimmy in the end? At a party, 1/2 of the adults is equal to 2/5 of the children. If there are 279 people altogether, how many children are there? 2 teachers and 6 pupils visited a zoo. 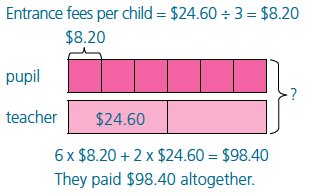 Each teacher paid $24.60 and each pupil paid 1/3 of the amount for the entrance fees. How much did they pay altogether? A a school concert, 1/5 of the audience was adults and the rest was children. There were 567 more children than adults. The ratio of the number of boys to the number of girls was 2:7. How many girls were there at the concert? At a Family Day event, 25% of the participants were parents. There were 84 more boys than parents who participated. The remaining 166 participants were girls. How many participants were there altogether? With an understanding of how bar models can be applied in word problems, you can now guide your primary school child through regular practices to tackle word problems confidently, be it for tests or examinations.